Homelessness has long featured in the media. Vagrancy, for instance, was a topic of regular media interest throughout the nineteenth century, both in the UK and the USA (see Hoch 1987; Jones 1982). More recently, the British public was shocked in 1966 by Cathy Come Home, a drama documentary about a family becoming homeless and spending time in temporary accommodation (Rose 1988, p. 178). The public outrage after the programme even led to the issue being raised in Parliament. Similarly, a later drama documentary in 1975, Johnny Go Home, set out the risks facing a young man coming to London with nowhere to stay; a government Working Group was set up as a result of this (Beacock 1979, p. 131). 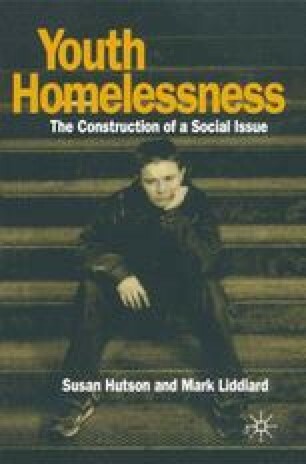 After a lull in media coverage, youth homelessness returned to the UK headlines in the 1980s and 1990s, with young homeless people featuring in documentaries and even appearing as characters in soap operas and comedy series.